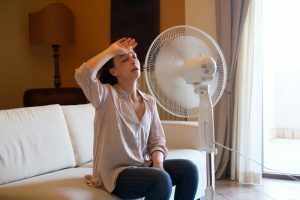 There are other ways to stay cool without turning your thermostat down as low as it will go (this is ineffective anyway since your air conditioner can only efficiently cool down to 20 degrees below the outside temperature). For instance, you can drink plenty of water, and cool down from time to time by using a cool washcloth or compress. You can also use your ceiling fans to help distribute the cooled air throughout your living space better. This could help you turn your thermostat up a few degrees, thus saving you money. It’s important to note here that a ceiling fan can’t actually cool down the temperature of your home, so using it when you’re not in the room is pointless. But it can certainly help you feel cooler, especially when you use it in combination with your air conditioner. Plus, if you close the curtains on the windows where the sun faces, this can help even more. Keep your thermostat at about 78 degrees Fahrenheit throughout the day when people are at home (you may need to adjust if you have seniors or babies in your home). Set your air conditioner to raise the temperature by 5-10 degrees when people are away or asleep. Have the settings automatically readjust to your preferences 20-30 minutes before you plan to arrive home for the full benefit. We get it, you have some appliances you absolutely have to use, like your washing machine and clothes dryer. But if you can, try to avoid using your oven on days that are exceptionally hot. It makes your air conditioner work that much harder. If you must, we recommend that you use your high-heat appliances at night, after the sun has gone down.